“We were up till 7am partying in Leeds last night,” says Matt Flegel, singer and bassist in apocalyptic Calgary post-punkers Viet Cong. This explains why they couldn’t make the interview we were promised. Unfortunately for him, he’s been cornered at the bar for a pre-gig interrogation. Fortunately for us, he’s very happy to chat. He sneaks outside for a nicotine hit, while we watch the support. They’re a really enjoyable outfit called Absolutely Free. Not, thankfully, a Free tribute band, but a bunch of Toronto krautrockers. They sound like Neu, but that’s ok, who doesn’t? If it ain’t broke, why fix it? 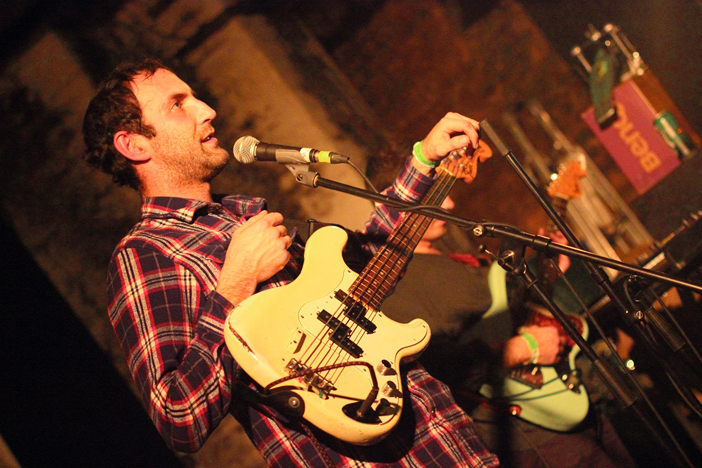 Despite being in the thick of a solid 15-night run of gigs, Viet Cong show no obvious signs of battle fatigue. They’re as tight as Noel Fielding’s trousers – but with Women’s rhythm section at their core we always knew they would be. The sound levels are perfect; it’s not ear-meltingly loud, but then it doesn’t need to be. After easing us in with a few surprisingly melodic non-album tracks, they smash us in the face with ‘Silhouettes’. From then on, it’s all about the LP. 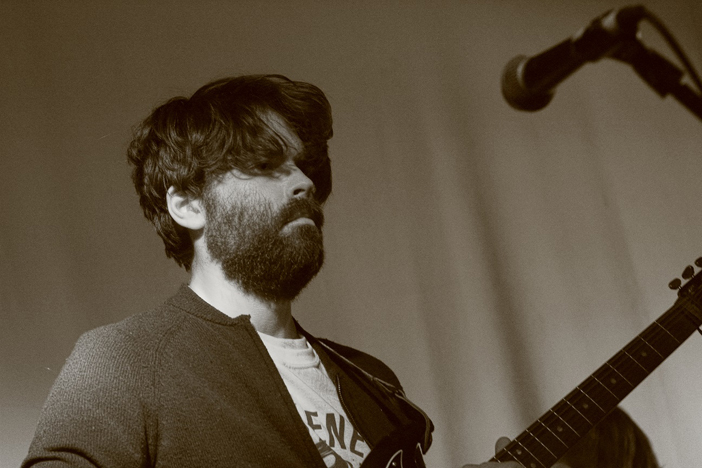 ‘Bunker Buster’ follows, with its pulsating, metronomic groove and Interpol-esque riffs. It’s an immense track. Guitarist Monty and drummer Mike are both wearing Brudenell Social Club t-shirts. That Leeds show must have been one hell of a night. Sadly, however, (and maybe it’s a Sunday thing) the Brighton crowd aren’t at their feistiest. They applaud at the appropriate junctures, but there’s no jumping around; no real banter with the band. Perhaps this is because they can’t move. Sadly, the Green Door Store is so full some poor punters literally can’t get into the room. The sound guy asks people to move forward, but it makes no difference. It’s a real shame, because when it’s not sold out this is one of the best venues in town. Unsurprisingly, they end on the intense, thumping 12-minute epic ‘Death’. Lyrically, like all their songs, it drips with delirium and decay. It’s like being sucked into a void; a fever dream of non-existence. The staccato cymbal-crashing section goes on for longer than on the LP, but doesn’t outstay its welcome. You can imagine it being extended further still, into their version of My Bloody Valentine’s infamous ‘Holocaust’. The boys then prove there’s life after ‘Death’ by granting us an encore. 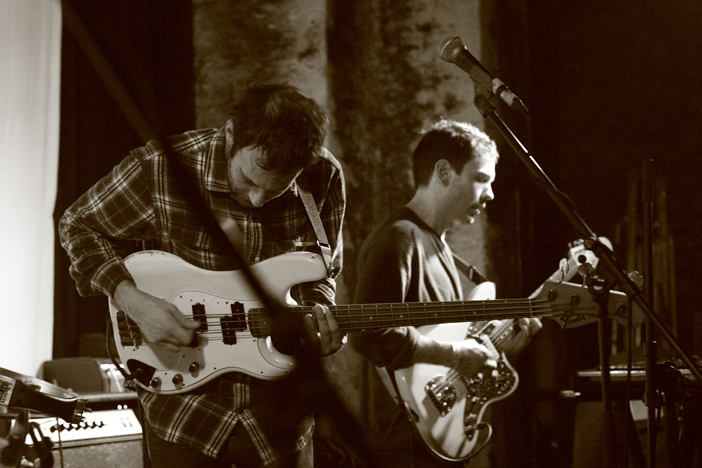 If there is a heaven, you can bet Viet Cong will be among the house bands.